Friendly Belligerent – Spectacular Comics – Buy more books! – (See more books!) – Be a person! Buy more books! - (See more books!) - Be a person! What are the next titles we can expect? 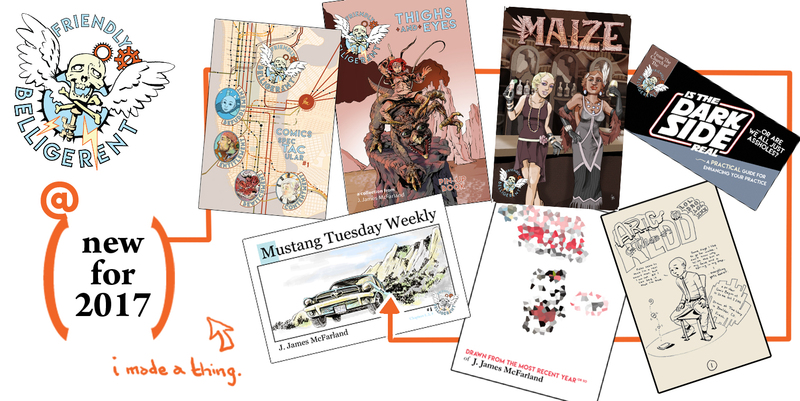 The next books out in 2019 will include the next chapters of Mustang Tuesday Weekly, Maize #3, Friendly Belligerent Comics Spectacular #2, and two more chapters of Zines About Hoarding. 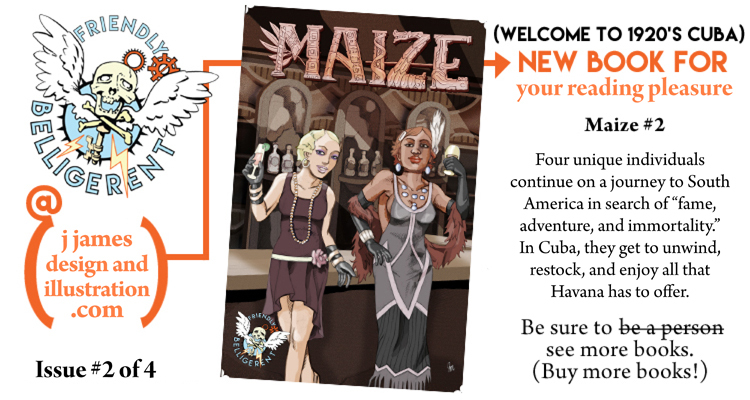 The goal will be to have the first two of them in April 2019 for Denver’s Independent Comics and Art Expo, the third for May/June’s Denver Pop Culture Convention and the final two in June 2019 for Denver’s Zine Fest. Please bookmark this site, as new products will continue to be added and featured as they are introduced! 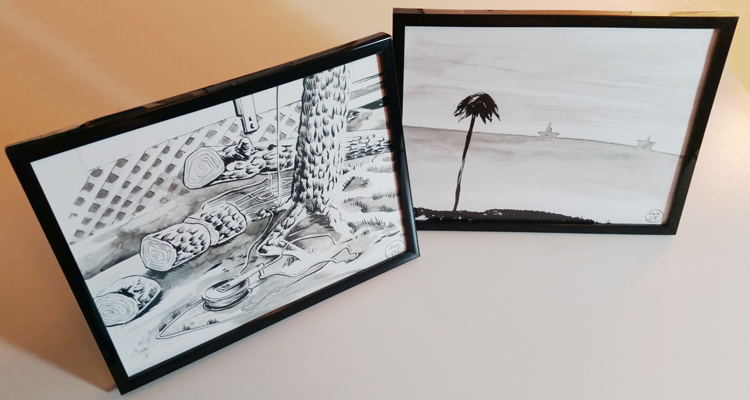 are framed in a 6″ x 8″ frame. Four unique individuals come together in a speakeasy in New York City in 1926 to embark upon an expedition to South America in search of fame, adventure, and immortality! Join Anders, Bethanny, Sam, and Byron on their adventure as they reach Cuba in this issue. What is more important to the team, resupplying for the next leg, or going clubbing in that lovely 20’s background? We’ll find out together! 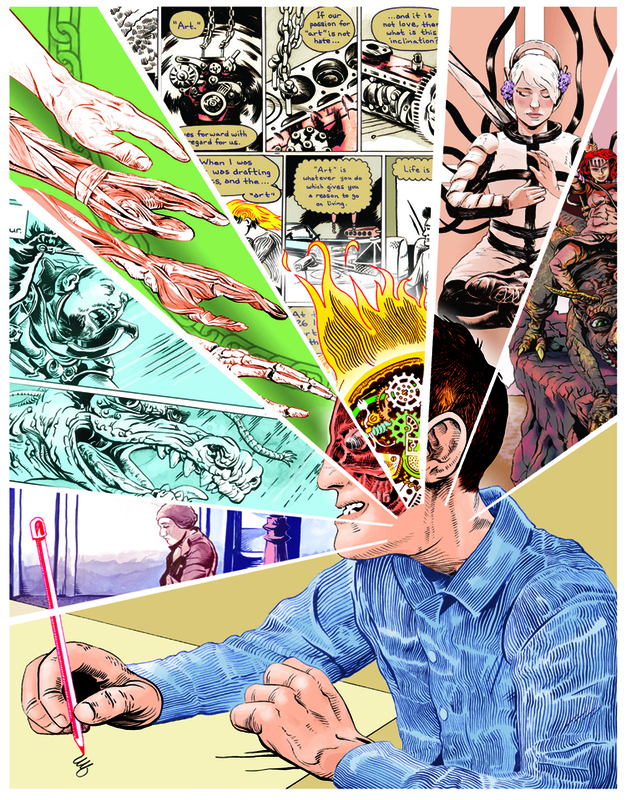 This 27 page comic is packaged together for the very first time in this format. This is an auto-biographical (that’s a pun, see) narrative concerning a period of time of about a year moving from city to city and rebuilding a life, a car, and an artist’s mind. Originally posted online in a weekly format in 9-week installments. 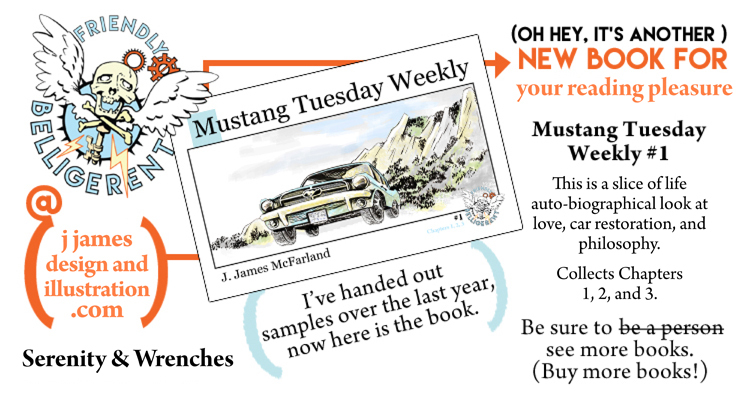 The first three chapters of Mustang Tuesday Weekly, considering success, failure, art, and one classic car. Friendly Belligerent Comics are the comics of J. James McFarland. The products featured here as of January 2019 are all-new, all fresh. There were an enormous amount of releases for 2017, including four new full comics, two very special image collections, a new 24-Hour Comic, and a rad little “Star Wars religious tract.” See the whole selection right here. Everything produced for DinK 2017, available now in the Friendly Belligerent “Whole Package” Box Set. Have one sent to you, today!